If there’s one thing I enjoy more than Mexican, it’s BBQ. I’ve been frothing at the mouth over episodes of BBQ Pitmasters (thanks Nextflix), which is a reality TV show were teams competitively BBQ a variety of meats. Each week they smoke a variety of ribs, brisket, chicken, pulled pork or ‘whole hog’ in an effort to win thousands of dollars in prize money and eternal glory. It’s ludicrously delicious, and I wanted in. 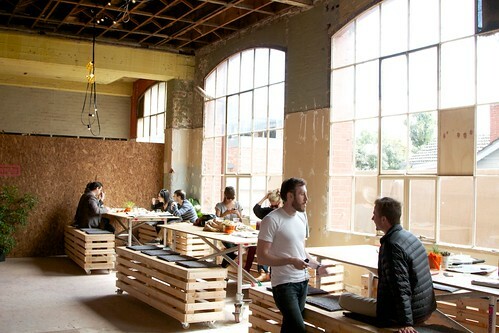 Luckily, a carefully crafted pop-up has appeared at the old Channel 9 studios in Richmond. Oh, you don’t know where that was? Neither did I until this weekend. The project is being sponsored by the developers, Lend Lease, who are redeveloping the site into apartments; their devilishly sly marketing campaign appears to be working surprisingly well. 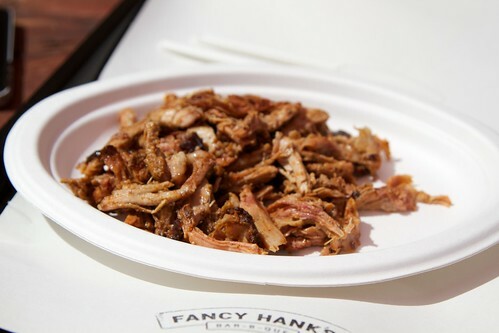 The pop-up project is called the Richmond Weekender, and the delicious sounding food component is Fancy Hank’s BBQ. After seeing on Twitter that they sold out of food relatively early last weekend, we did the uncool thing and rocked up bang on 12. We had our pick of the exterior tables, where we had a beautiful view of the enormous smoker that they brought in for the event. As Gerard mentioned we recently watched a full season of BBQ Pitmasters, an amazing reality show about competitive BBQing. I’m a firm believer that everything is better when it’s competitive and involves reality-tv style scheming. Food and reality tv are probably my biggest weaknesses, so combining them is just my idea of perfection. Anyway, a season of BBQ Pitmasters had left me craving pulled pork and ribs. 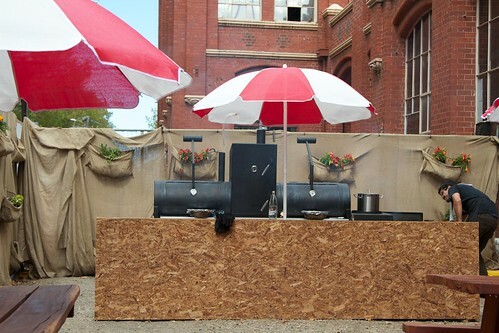 Sadly they’re not the sort of meats that are easy to come by in Melbourne, so I was super excited when I saw on Broadsheet that a pop up US-style BBQ had opened at the old ch 9 studios, AKA the Richmond Weekender. 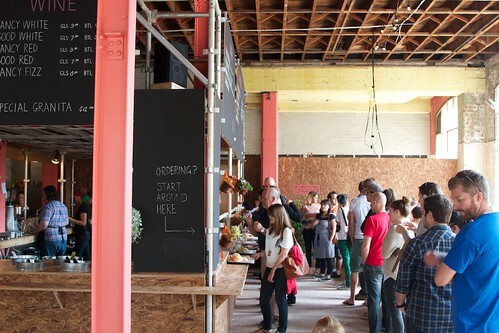 The fit out was impressive, particularly for a pop up, a lot of effort seemed to have gone into it. 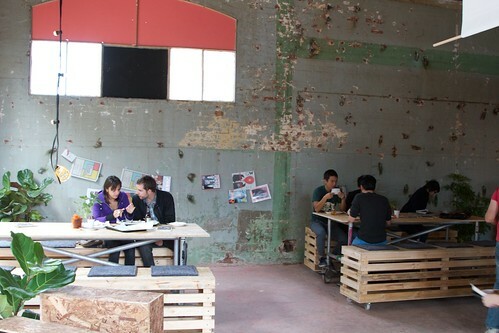 Inside was a cool industrial-style space and outside there were a group of picnic tables and colourful umbrellas where you could sit in the sun and soak up the sweet smell of ribs. Perfect. The menu is pretty simple – rolls, 3 types of meat (pulled pork, ribs and brisket), a selection of sides & sauces and a selection of salads. All meats are ordered by weight (priced per 100g). We ordered 2 sourdough rolls, a side of potato salad ($6 small, $9 large) and some BBQ sauce ($2). Meat-wise we started with approx 300g of the pulled pork ($5.50 per 100g) which we made up some rolls with. Gerard wasn’t a fan of the pork at all, saying it was far too dry. Personally I quite liked it though, especially with a good hit of BBQ sauce. Next up were approx 200g of ribs ($8 per 100g, that’s right, $80 a kg ribs). The ribs were a little burnt/dry. And expensive, seriously, at $80 a kg these were definitely the worst value item. 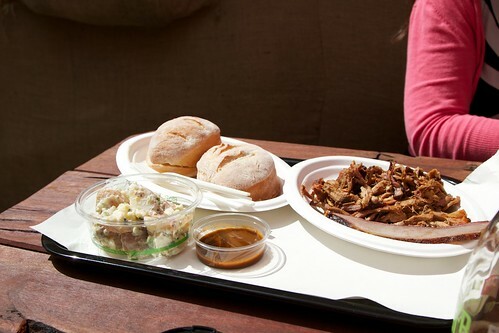 We also tried a piece of brisket – only one because we were on more of a pork than beef bent ($4.50 per 100g). The lines are long and slow, the meat isn’t perfect and the prices are pretty high. Would I take it all back? No, it’s definitely an overall experience that I enjoyed. If I were going back I’d just make sure that I only got ribs if they didn’t look burnt, and had plenty of condiments with my pork. If it’s your kind of thing get in quick, because it’ll only be around for another 3 weekends. 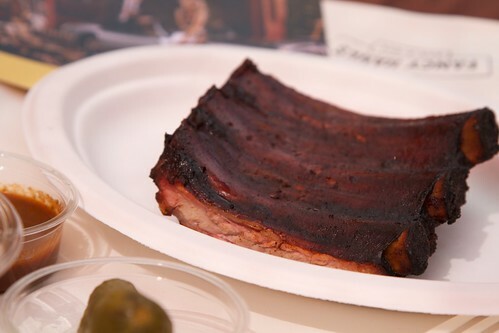 If you like American Style Barbeque then check us out…. Thanks for the heads up, Jim! The more BBQ in Melbourne, the better. Particularly if it’s on wheels.